The very assembling of kanji (Japanese characters) when writing is an assembling of things/objects and pictures: the making on paper of a world of matter and elemental forces in miniature. There is a deep sense of placing, space, silence and rhythm in all decisions and actions taken by the Japanese. This is shared communally. Impossible to imagine it happening any more in the multi-ethnic, rationalist and individualist brew of our Western cities and even countrysides. Mobile phones cannot be used in any carriages in Japan to communicate beyond the present place and moment. Except, I suppose, to imaginary worlds. The great shrines and temples are there because the landscape calls for them to be there: by decree of hill-allignment, water flow, mountain peak or volcanic action. And all the old things placed upon the earth or in the old houses are made of things of the earth: wood, metals, bamboo, hemp, grasses, paper and rice stalks. The sense of design harmony from micro- to macrocosm is constantly breathtaking and deeply moving. I arrived with the impression Japan must have been irrevocably violated, its harmony shattered several times over, by the 18 & 19th century Western trading invasions and the 20th century nuclear bombs on Hiroshima and Nagasaki – and finally buried by the most vicious of all gods: Mammon and his capitalist concrete footprint. But I feel from day two in captivating Matsue that the heart and soul of Japan are untouched by these things. No house, no garden, no street, no town, no rice-paddy or graveyard (with only ghosts in the graves – or outside them – the Japanese Shinto way is cremation) is without its flowering of shrines. 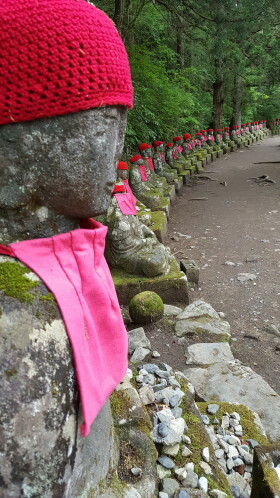 The core of whatever it is to be Japanese has been protected, hidden personally and communally, is what I feel: cloaked by the guardian spirits as the cloak of Jizo protects the ghosts of children while they rebuild the stone shapes of their old life forms. It may be because we barely touch Tokyo (only to arrive and leave and for one day in the middle, to meet Butoh sensei Yoshito Ohno and theatre producer Alex Rutter), but ‘westernised’ civilisation as we saw it is just a string of concrete islands in the vast acres of paddy fields (those rice fields of gold, always a currency in Japan) – and forested hillsides. Moving by train and boat and plane, fluidity has a permanence all its own – ask the oceans – and not even the horrendous 2011 tsunami has succeeded in breaking Japan’s heart. We visited the area, and it heals, it replants, it recovers, it accepts such things happen and will happen again. It tells stories over and around it. Thrives. It takes great skill to use the brush when writing kanji – and great wisdom to let go from the head and follow where the brush leads the hand and heart and feet. When I get home I dream I don’t know where I am. Partly jetlag. Partly exhaustion. Also: a sense of two cultures, two houses, two worlds now overlaid in my consciousness as I sleep. Ghosts are slipping out and in through doors of space and the shadows behind and between them.